An impaired differentiation of naive CD4+ T cells towards Th2 cells may contribute to the chronic tissue-destructive T-cell activity in rheumatoid arthritis (RA). The differentiation of naive CD4+ T cells into memory Th2 cells by IL-7 in comparison with that by IL-4 was studied in RA patients and in healthy controls. Naive CD4+ T cells from peripheral blood were differentiated by CD3/CD28 costimulation in the absence of or in the presence of IL-7 and/or IL-4. The production of IFN-γ and IL-4 was measured by ELISA and by single-cell FACS analysis to indicate Th1 and Th2 cell activity. CD3/CD28 costimulation and IL-7 were early inducers of IL-4 production, but primarily stimulated IFN-γ production. In contrast, in short-term cultures exogenously added IL-4 did not prime for IL-4 production but suppressed IL-7-induced IFN-γ production. 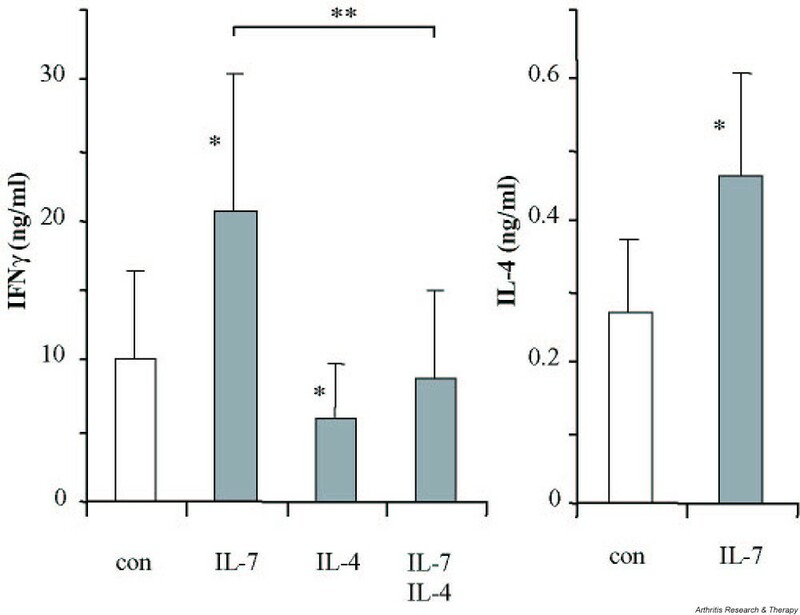 Upon long-term stimulation of naive CD4+ T cells, IFN-γ production was differentially regulated by IL-7 and IL-4, but IL-4 production was increased by both IL-7 and IL-4. IL-7 and IL-4 additively induced polarization towards a Th2 phenotype. This susceptibility of naive CD4+ T cells to become Th2 cells upon culture with IL-7 and IL-4 was increased in RA patients compared with that in healthy controls. These findings demonstrate that, in RA patients, differentiation of naive CD4+ T cells towards a Th2 phenotype by CD3/CD28 costimulation, IL-7 and IL-4 is not impaired. The perpetuation of arthritogenic T-cell activity in RA therefore seems not to be the result of intrinsic defects of naive CD4+ T cells to develop towards suppressive memory Th2 cells. T cells and macrophages are considered to play an important role in the initiation and perpetuation of inflammatory responses in rheumatoid arthritis (RA) [1–3]. Stimulation of macrophages can be mediated by activated memory CD4+ T cells that are abundantly present in the inflamed joints of RA patients [2, 4, 5]. In this respect, many studies have focused on the balance of Th1 and Th2 cells. The Th1 subset has been defined by the specific production of IFN-γ and IL-2, and by the stimulation of cell-mediated immunity, whereas the Th2 subset specifically produces IL-4 and stimulates humoral immunity [6, 7]. Based on analysis of IFN-γ and IL-4 production, a dominance of Th1 cell activity over Th2 cell activity has been shown in the inflamed joints of RA patients [8, 9]. This imbalance of Th1/Th2 cells was shown to correlate with disease activity scores . Although IL-4 production by T cells from the peripheral blood of RA patients is increased compared with that of healthy controls, this Th2 activity seems to be insufficient to control Th1-associated inflammation in RA [11–13]. IL-4 and other suppressive cytokines that can be produced by Th2 cells (e.g. IL-10 and IL-13) suppress activity of several cell types that contribute to inflammation in the RA joints [14–16]. In vitro and in vivo induction of Th2 cell activity has been associated with anti-inflammatory responses and disease suppression in RA [4, 17]. Induction of Th2 cell activity as well as administration of Th2 cytokines can offer protection against experimental collagen-induced arthritis [18, 19]. Prevention of joint destruction is shown to be the final result of such elevated Th2 activity [17, 20, 21]. Together these data suggest that RA patients may benefit from therapies aimed at the regulation of the Th cell balance towards Th2 cell activity. It also implies that intrinsic defects in the responsiveness of T cells to factors that can support the generation of Th2 cell activity, in peripheral lymphoid tissues and at the inflammatory sites, could cause or contribute towards RA. The activation of naive CD4+ T cells towards IL-4-producing Th2 cells has been shown to require signaling through the TCR/CD3 complex together with costimulation. Since memory cells are less dependent on such costimulation to produce IL-4, in particular the development of naive CD4+ T cells towards Th2 cells may be disturbed in RA patients. Circulating naive CD4+ T cells can enter areas of primary T-cell stimulation and can interact with antigen-presenting cells. Here naive cells can differentiate into memory effector Th cells. Factors that drive the initial expression of IL-4 (as the major Th2-defining cytokine) in human naive CD4+ T cells include costimulation via CD28 in concerted action with TCR engagement . It has been shown in humans [22, 23] and in mice [24, 25] that, in an autocrine way, the initial endogenous IL-4 production, or IL-4 from other sources, can stimulate the development of IL-4-producing CD4+ T cells. To achieve this, naive CD3-activated T cells need to be stimulated in the presence of CD28 costimulation [22, 23, 26, 27]. This is in contrast to (human) memory CD4+ T cells, which can produce IL-4 upon CD3 stimulation alone, but production is more pronounced when cultured in the presence of IL-4 . IL-7, in contrast to IL-4, has recently been shown to prime human naive neonatal CD4+ T cells for IL-4 production in the absence of CD28 costimulation . Thus, in humans, IL-7 produced by stromal cells in the peripheral lymphoid organs that play an important role in lymphocyte development, including the lymph nodes, the spleen and the mucosal lymphoid tissues, may be more effective (than IL-4) in driving naive CD4+ T cells to a Th2 phenotype . The shortage of suppressive Th2 activity in RA patients [8–10] is assumed to be involved in the chronic inflammatory activity in these patients. This shortage may be the result of a defect in the capacity of naive CD4+ T cells to respond adequately to stimuli such as TCR(CD3)/CD28 costimulation, IL-7 and IL-4, and by that to become Th2 cells. Recent studies have shown that IL-7 is produced by activated synovial fibroblasts from RA patients , and that circulating levels of IL-7 were shown to correlate with markers of disease . The present study evaluated whether circulating naive CD4+ T cells displayed an impaired response to IL-7 (and IL-4), and demonstrates that such a defect is not present in RA patients. In contrast, differentiation by IL-7 and IL-4 towards Th2 cell activity was increased in RA patients. Mononuclear cells were isolated from the peripheral blood of a total of nine randomly selected patients with RA and of nine healthy age-matched controls. RA was defined by the 1987 revised American College of Rheumatology criteria . Patients (seven females and two males) ranged in age from 33 to 73 years with a mean age of 53 ± 13 years. Seven patients were rheumatoid factor-positive and two patients were rheumatoid factor-negative. Seven patients received nonsteroidal anti-inflammatory drugs, five patients took slow-acting antirheumatic drugs, and two patients were on low-dose prednisone. Healthy controls ranged in age from 37 to 72 years with a mean age of 50 ± 14 years, not statistically significant different from the RA group. Peripheral blood was diluted 1:1 with DMEM (Gibco 074-01600, 24 mM NaHCO3; Gibco, New York, USA) containing glutamine (2 mM), penicillin (100 U/ml) and streptomycin sulfate (100 μg/ml; DMEM+). Mononuclear cells were isolated by density centrifugation using Ficoll-Paque (Pharmacia, Uppsala, Sweden). The viability of the cells, checked by trypan blue exclusion, was always more than 95%. CD4+ T cells were isolated from the peripheral blood mononuclear cells by means of microbead-activated cell sorting according to the manufacturer's instructions (Mylteni Biotec, Bergisch Gladbach, Germany). Briefly, depletion of CD4-negative T cells was achieved by incubation of peripheral blood mononuclear cells with a cocktail of monoclonal antibodies directed against non-T cells and against CD4-negative T cells, followed by binding of a secondary microbead-coupled antibody to bind to the primary antibodies. Microbead-labeled cells were removed by binding to a magnet. CD45RA+ (naive) T cells were obtained by depleting the CD4+ population of CD45RO+ (memory) T cells, using microbead-coupled CD45RO antibodies. The purity of the CD4+CD45RA+ T-cell population was checked by FACS analysis, and exceeded 95%. These naive CD4+CD45RA+ T cells were cultured (5 × 105 cells/ml) in DMEM+ supplemented with 10% pooled human male AB serum (Red Cross Blood Transfusion Centre, Utrecht, The Netherlands) and soluble CD3/CD28 monoclonal antibodies (1 μg/ml) (CLB-T3/4.E and CLB-CD28, respectively; CLB Reagentia, Amsterdam, The Netherlands ) for 10 days. Cells were washed three times on day 5 and seeded at a concentration of 1 × 106 cells/ml for the subsequent 5-day culture. Cells were stimulated with or without IL-7 (Genzyme, Cambridge, MA, USA), with or without IL-4 (a kind gift from Dr S Narula, Schering-Plough Research Institute, Kenilworth, NJ, USA), or with or without IL-7 and IL-4 (both 10 ng/ml). IFN-γ and IL-4 production were analyzed by ELISA upon costimulation with CD3/CD28 and cytokines after 5 days of culture. After both 5 and 10 days of culture, cells were extensively washed (three times), seeded at a concentration of 106 cells/ml and restimulated with ionomycin (1 μg/ml; Sigma, St Louis, MO, USA) and phorbol myristate acetate (50 ng/ml; ICN Pharmaceuticals, Costa Mesa, CA, USA) for 24 hours. The media were harvested and freed of cellular material by centrifugation (5 min, 900 × g), frozen in liquid nitrogen and stored below -20°C. IFN-γ and IL-4 in the culture supernatant was determined by ELISA according to the manufacturer's instructions (Medgenix, Flerus, Belgium). FACS analysis was used for IFN-γ and IL-4 analysis at the single cell level. After cells had been cultured for 10 days they were extensively washed, were seeded at a concentration of 106 cells/ml and were stimulated with ionomycin/phorbol myristate acetate for 6 hours. To enhance intracellular fluorescence, protein secretion was inhibited by the addition of 10 μg/ml Brefeldin A (ICN Pharmaceuticals) during the final 2 hours of culture. The cells were fixed and permeabilized with a fixation and permeabilization kit, according to the manufacturer's instructions (Caltag Laboratories, Burlingame, CA, USA). Fluorochrome-labeled anti-IFN-γ, anti-IL-4 and isotype control antibodies (Caltag Laboratories) were added during the permeabilization step (1 μg/ml) to stain the intracellular cytokines. Fluorescence was analyzed with a FACScan (Becton Dickinson, Mountain View, CA, USA). The quadrant markers for the bivariate dot plots were set based on the autofluorescence control, and they were verified with isotype control antibodies. Statistical evaluation of differences in cytokine production was performed by the Wilcoxon and Mann–Whitney U tests when appropriate. Data were considered statistically significant at P < 0.05. Although CD45RA+ CD4+ T cells in RA patients can be isolated from the inflammatory sites (synovial fluid and tissue), many inflammatory stimuli in these compartments can modulate their activity. CD45RA+CD4+ cells from the joint were therefore not used as truly naive CD4+ cells, but instead circulating CD45RA+ CD4+ T cells from the peripheral blood were used as primary naive cells. CD3/CD28 costimulation of naive CD4+ T cells from RA patients for 5 days induced large amounts of IFN-γ and only limited amounts of IL-4 (10.0 ± 4.7 ng/ml and 267 ± 110 pg/ml, respectively). The IFN-γ production of this ex vivo population was significantly lower than that of healthy controls (32.2 ± 9.7 ng/ml, P < 0.05), whereas IL-4 production (288 ± 82 pg/ml) was not significantly different. 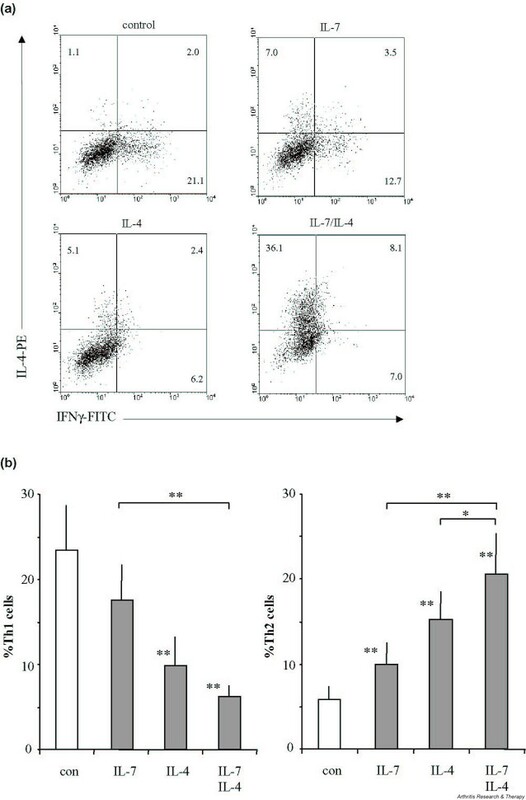 IL-7 enhanced both IFN-γ and IL-4 production of costimulated naive CD4+ T cells from RA patients, whereas IL-4 significantly inhibited IFN-γ production, both in the absence of and in the presence of IL-7 (Fig. 1). These effects were not different in healthy controls (data not shown). IFN-γ and IL-4 production of CD3/CD28 costimulated naive CD4+ T cells from rheumatoid arthritis patients (n = 9) stimulated for 5 days in the presence of IL-7. Because of exogenously added IL-4, only the production of IFN-γ is shown for cells cultured in the presence of IL-4 or of IL-7 and IL-4. *P < 0.05, statistically significant differences versus control cultures in the absence of added cytokines (con). A significant difference between IL-7 and IL-7/IL-4 is also indicated (**P < 0.01). To measure the effects of exogenously added IL-4 (and IL-7), cells from RA patients were washed extensively and restimulated with ionomycin/phorbol myristate acetate (Fig. 2a). This restimulation resulted in increased production of IFN-γ and IL-4 (control cultures of Figs 1 and 2a). IL-7 pretreatment had significantly sensitized the naive CD4+ T cells for increased IL-4 production compared with the control culture, whereas IFN-γ was not significantly increased by IL-7. In contrast to IL-7, addition of exogenous IL-4 during the primary stimulation had not primed T cells for increased IL-4 production, but had strongly suppressed IFN-γ production. IL-7 added together with IL-4 resulted in a further increase of IL-4 production and a significantly decreased IFN-γ production compared with IL-7 and IL-4 alone. IFN-γ and IL-4 production of CD3/CD28 costimulated naive CD4+ T cells from rheumatoid arthritis patients (n = 9) differentiated during (a) 5-day cultures or (b) 10-day cultures in the presence of IL-7, of IL-4, or of IL-7 and IL-4. Cytokine production of differentiated cells was analyzed upon ionomycin/phorbol myristate acetate restimulation for 24 hours. *P < 0.05 **P < 0.01, statistically significant differences versus control cultures in the absence of added cytokines (con). Significant differences between the cytokine treatments are indicated separately. The effect of IL-7 and/or IL-4 on the production of IFN-γ (Th1) and IL-4 (Th2) production during long-term culture of CD45RA+ CD4+ T cells is depicted in Fig. 2b. After this culture of naive (CD45RA+) CD4+ T cells from RA patients (Figs 2b and 3) and from healthy controls (Fig. 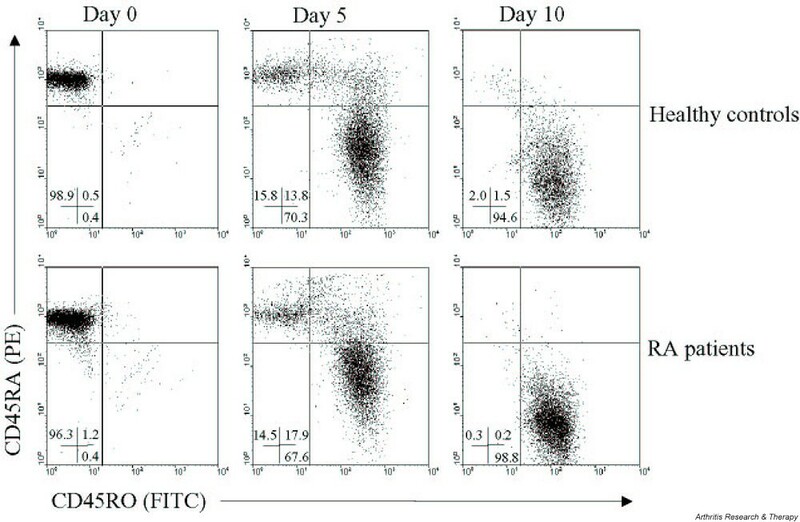 3) for 10 days, nearly all cells were differentiated into CD45RO+ memory T cells (Fig. 4). IL-7 alone did not change IFN-γ production under these conditions, but it still enhanced IL-4 production. Long-term exposure to IL-4 suppressed IFN-γ production and, in contrast to short-term culture, increased IL-4 production. 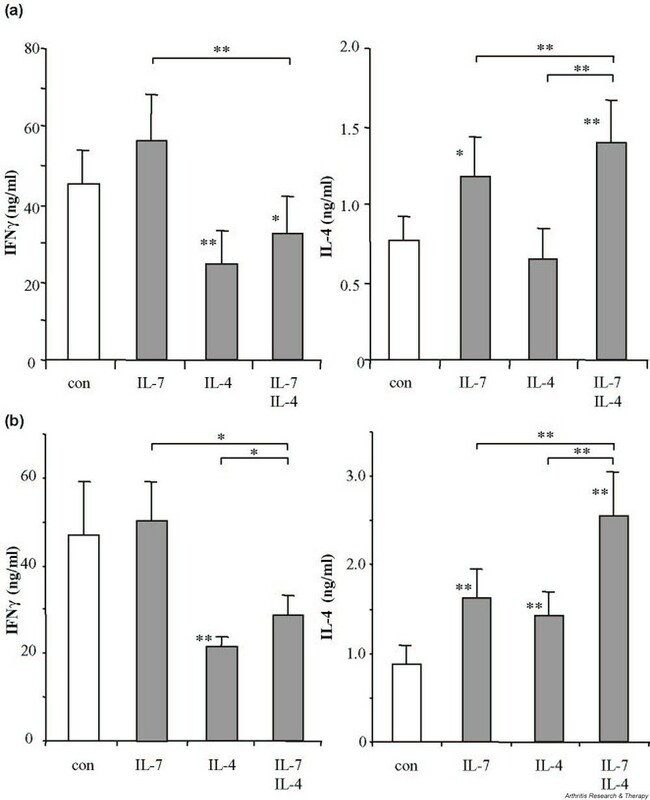 The combination of IL-7 and IL-4 reduced IFN-γ levels and additively enhanced IL-4 production (Fig. 2b). Inhibition of IFN-γ production by IL-7 and IL-4 was significantly different from IL-7 alone, but not statistically different from IL-4 alone. With respect to the increase of IL-4, the combination was significantly additive to the effect of either IL-7 or IL-4 alone. The production of IFN-γ and IL-4 by CD3/CD28 costimulated naive CD4+ T cells from healthy controls (n = 9, white bars) and rheumatoid arthritis (RA) patients (n = 9, black bars) differentiated during 10 days of culture in the presence of IL-7, of IL-4 or of IL-7 and IL-4. Cytokine production of differentiated cells was analyzed upon ionomycin/phorbol myristate acetate restimulation for 24 hours. Values are expressed as percentages of cytokine levels produced in the absence of exogenously added cytokines (control values set at 100% for RA patients and controls, respectively, were 47.1 ± 12 ng/ml versus 37.1 ± 5.7 ng/ml for IFN-γ, and 0.89 ± 0.21 ng/ml versus 0.95 ± 0.15 ng/ml for IL-4; not significantly different). #P < 0.05, statistically significant differences between RA patients and healthy controls; *P < 0.05, **P < 0.01, statistically significant differences between control and cytokine-treated cultures. Differentiation of naive CD4+ T cells (CD45RA+) towards memory CD4+ T cells (CD45RO+) in rheumatoid arthritis (RA) patients and in healthy controls after CD3/CD28 costimulation for 5 and 10 days. The numbers in each quadrant indicate the percentage of CD45RA+ (upper left), CD45RO+ (lower right) and CD45RA+ CD45RO+ double positive cells (upper right). PE, phycoerythrin; FITC, fluorescein isothiocyanate. The differentiation of naive CD4+ T cells towards the Th2 memory phenotype was not impaired in RA patients when compared with healthy controls (Fig. 3). Regulation of IFN-γ production of CD4+ T cells in RA patients by IL-7 alone, by IL-4 alone or by IL-7 and IL-4 was not significantly different from healthy controls (Fig. 3, left panel). The percentage increase in IL-4 production after differentiation by IL-7 and IL-4 was higher in RA patients than in healthy controls. The additive induction of IL-4 by combined differentiation with IL-7 and IL-4 was even significantly higher in RA patients (Fig. 3, right panel). Single-cell analysis was performed to verify polarization of the RA CD4+ T cells after differentiation towards either a Th1 or a Th2 phenotype (Fig. 5a is representative of FACS analysis, and Fig. 5b shows the average percentages of Th1 and Th2 cells of seven RA patients). Without IL-7 or IL-4, a large number of the CD4+ T cells produced IFN-γ but no IL-4 (Th1, average 23.5%), whereas few cells produced IL-4 but no IFN-γ (Th2, average 5.9%). In control cultures a Th0 phenotype was found, on average, in 3.6 ± 0.9%, whereas 73.1 ± 2.4% was double negative. The numbers of Th0 and double negative cells were not significantly changed by IL-7, by IL-4 or by their combination (data not shown). The numbers of Th1 and Th2 cells resembled cytokine secretion profiles (Fig. 2b). IL-7 did not significantly alter the number of Th1 cells, whereas IL-4 reduced this number. However, both IL-7 and IL-4 increased the number of Th2 cells. Furthermore, IL-7 and IL-4 additively decreased the number of Th1 cells and additively increased the number of Th2 cells. Intracellular detection of IFN-γ and IL-4 by FACS analysis. (a) A representative of seven rheumatoid arthritis (RA) patients of which mean values are shown in (b). Cytokine production of the CD3/CD28 costimulated CD4+ T cells was assessed after 10 days of culture in the absence or presence of IL-7, of IL-4 or of their combination. Cytokine production of differentiated cells was analyzed upon ionomycin/phorbol myristate acetate stimulation for 6 hours in the presence of Brefeldin A. Means ± standard errors of the mean of percentages from cells of RA patients that produce IFN-γ but no IL-4 (Th1) and that produce IL-4 but no IFN-γ (Th2) upon differentiation are shown. *P < 0.05, **P < 0.01, statistically significant differences between control (con) culture and cultures with IL-7, with IL-4 or with IL-7 and IL-4. Significant differences between the cytokine treatments are indicated separately. PE, phycoerythrin; FITC, fluorescein isothiocyanate. The apparent shortage of Th2 cell activity in the RA patients has been suggested to contribute to the ongoing inflammation in RA patients [4, 5, 8–10]. A deficiency of primary naive CD4+ T cells of RA patients to respond to IL-4-inducing factors was the hypothesis of the present study. The differentiation of naive CD4+ T cells towards IL-4-producing Th2 cells requires stimulation through the TCR/CD3 complex together with costimulatory signals. Since memory cells do not require this costimulation, in particular the development of naive CD4+ T cells towards Th2 cells was hypothesized to be impaired in RA patients. In line with earlier studies [22, 26], we found that a relatively short activation period (the first 5 days of culture) of naive CD4+CD45RA+ T cells from RA patients through the TCR/CD3 complex together with CD28 costimulation by itself induces IL-4. Furthermore, it was found that during this period IL-7, but not IL-4, is a soluble factor for early IL-4 induction in naive CD4+ T cells in (adult) RA patients, which has also been described for human neonatal naive CD4+ T cells . The fact that IL-4 is not an early differentiation factor for naive CD4+ T cells is in line with data from adult healthy controls . Upon long-term culture, however, which is associated with the acquirement of the memory phenotype, exogenously added IL-4 also increases the endogenous IL-4 production and persistently inhibits IFN-γ production. Most important, with respect to IL-4 induction, there was no lack in responsiveness to IL-7, to IL-4 or to their combination in RA patients compared with in healthy controls. On the contrary, induction of IL-4 was even more pronounced for RA patients than for healthy controls. Although we show that IL-7, and in particular the combination of IL-7 and IL-4, increased Th2 activity rather than Th1 activity of naive CD4+ T cells, this was only found under conditions where IFN-γ production was already maximally stimulated. In the absence of CD3/CD28 costimulation or less optimal stimulatory conditions (data not shown), we and other workers have found that IL-7 increases primarily IFN-γ production of isolated naive CD4+ T cells . In agreement with this capacity to induce arthritogenic T-cell activity in RA patients, we have found that IL-7, in the context of synovial accessory cells, strongly stimulates T-cell IFN-γ and tumor necrosis factor alpha production without induction of IL-4 . IL-7 produced by fibroblast-like synoviocytes in RA joints is therefore suggested to contribute to the local inflammatory response . However, IL-7 under certain conditions or at sites different from the joint could promote regulatory T-cell activity. Increased levels of circulating IL-7 in patients with RA and juvenile idiopathic (rheumatoid) arthritis [30, 33] correlated with increased parameters of disease. 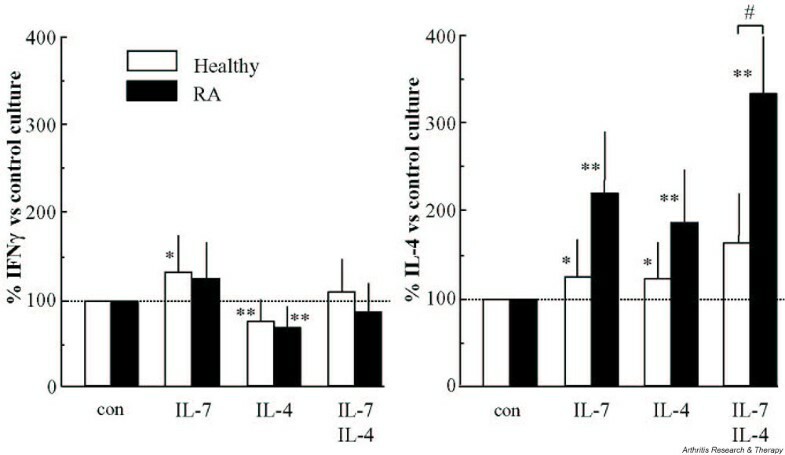 Since increased peripheral Th2 cell activity has also been observed to correlate with increased disease activity in RA patients [11–13], it can be speculated that circulating IL-7 or IL-7 produced in peripheral lymphoid organs  may contribute to this relatively enhanced peripheral Th2 activity in RA patients compared to healthy controls. The reduced capacity of Th2 cells to migrate to the arthritic sites could subsequently facilitate the presence of these cells in the peripheral blood and their absence in the joint . The present study suggests that the chronic immune response in RA is not caused by an intrinsic defect of naive CD4+ T cells of these patients to produce IL-4 in response to costimulation and differentiating factors such as IL-7 (and IL-4). Therapies aimed at the regulation of disease activity by induction of suppressive Th2 cell activity in RA therefore do not seem to be hampered by an intrinsic defect of naive T cells to respond to IL-4-inducing stimuli. This work was financially supported by the Dutch Arthritis Association ('Nationaal Reumafonds').